Denon announces AVR-X6200W AV receiver | What Hi-Fi? The AVR-X6200W is a nine-channel amp, with 205W per channel and features support for Dolby Atmos, DTS:X and full 4K Ultra HD. The X6200W joins Denon’s five-strong ‘X’ range of home cinema amplifiers for 2015. Under the hood, there’s a discreet monolithic design with custom-made Denon High Current Transistors (DHCT). Denon claims these help to provide a sound with “astonishing clarity, power, detail and depth". Denon’s proprietary D.D.S.C-HD (Dynamic Discrete Surround Circuit High Definition) circuit is also onboard, and this is complemented by AL24 Processing Plus and high-quality DACs. The X6200W supports Dolby Atmos and also has a Dolby Surround upmixer onboard to send audio to Atmos-enabled speakers. The amp can support speaker configurations up to 7.1.4 or 9.1.2 if an additional 2-channel power amplifier is added. A free firmware update later in 2015 will bring support for DTS:X and DTS Neural:X upmixer, as well as the Auro-3D sound processing engine. The X6200W can be used for multi-zone listening and home automation due to its 13.2-channel pre-out section, RS232 port and flexible amp assignment options. Connections include eight HDMI 2.0 inputs and three outputs, with HDCP 2.2 supported for 4K Ultra HD playback. Bluetooth and wi-fi are built-in, for wireless streaming from compatible Bluetooth devices, NAS drives, internet radio, Spotify Connect and Apple AirPlay. High-res audio formats including FLAC, AIFF and DSD are supported. 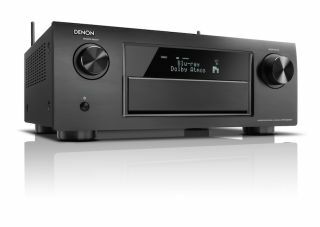 The Denon AVR-X6200W will be available from October, in either black or silver finishes, priced £1799.